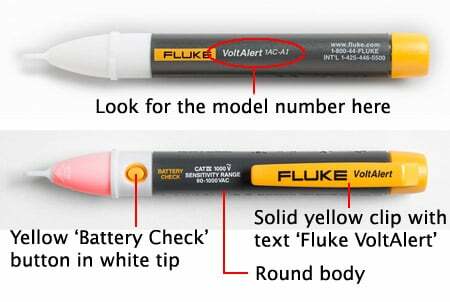 In cooperation with the U.S. Consumer Product Safety Commission, Fluke is voluntarily recalling its Fluke 1AC-I VoltAlert™ voltage tester, a product that was first released for sale on September 29, 2009. The affected model number is listed in the table below. If you own a Fluke 1AC-I (1AC-A1-I), please stop using it and send it back to Fluke for a replacement unit. If you are not the primary user of the 1AC-I please pass this notice along to the appropriate people within your organization. This recall does not include VoltAlert models 1AC-II, 1LAC-II and LVD2, none of which includes the battery check button or the Fluke logo on its clip, as shown below on the recalled units pictured. To properly identify your 1AC-I tester as a recalled product, look for the four product characteristics below. The testers can fail to give an indication of live voltage, resulting in the operator falsely believing the electrical power is off, posing a risk of serious injury or death from electrical shock or thermal burns. Stop using the Fluke 1AC-I even if you have not experienced problems. Verify your 1AC is affected by this recall using the images above. Return your 1AC-I for a free replacement of either a Fluke 1AC-II or LVD2. Indicate which replacement product you would like Fluke to provide. When Fluke receives your 1AC-I, we will send you, free of charge, the Fluke model 1AC-II or LVD2 that you selected. Note: If no selection is made, Fluke will automatically send a 1AC-II.